In stock -This product will ship today if ordered within the next 15 hours and 15 minutes. Developed for the modern skin you’re in, MagnesiumSkin Body Butter helps your skin take on whatever the world throws at it. Magnesium is a powerhouse mineral, crucial not only for overall skin health but importantly its ability to repair and function as a protective barrier. MagnesiumSkin Body Butter has passed the most rigorous of trials so that you can be confident of its suitability for, and effective support, of the most sensitive skin conditions and the harshest of modern environments. It is designed to be used daily to help improve skin elasticity and promote overall skin health whilst leaving your body indulgently moisturised. 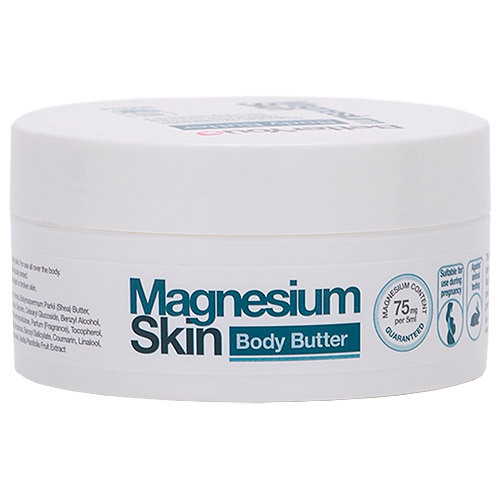 The key difference between the BetterYou Magnesium Body Lotion and BetterYou MagnesiumSkin Body Butter is the magnesium content. The lotion contains 30% magnesium oil giving it the lighter feel while the butter contains 15% magnesium oil making it much thicker. BetterYou uses only the finest, 100% natural ingredients believing that these are better absorbed and utilised by our bodies than more commonly used, isolated or synthetic ingredients. Aqua (Water), Cocos Nucifera (Coconut) Oil, Cetearyl Alcohol, Butyrospermum Parkii (Shea Butter), Magnesium Chloride, Sorbitan Stearate, Caprylic/Capric Triglyceride, Glycerin, Cetearyl Glucoside, Benzyl Alcohol, Theobroma Cacao (Cocoa) Seed Butter, Hydroxyethylcellulose, Parfum (Fragrance), Tocopherol, Dehydroacetic Acid, Citric Acid, Xanthan Gum, Butylphenyl Methylpropional, Benzyl Salicate, Coumarin, Linalool, Alpha-Isomethyl Ionone, Hexyl Cinnamal, Limonene, Hydroxycitronellal, Vanilla Planifolia Fruit Extract. Gently massage MagnesiumSkin Body Butter into clean, dry skin. For use all over the body. For the best results, use after having a bath or shower. Below are reviews of BetterYou MagnesiumSkin Body Butter - 200ml by bodykind customers. If you have tried this product we'd love to hear what you think so please leave a review. I'm a first time user so I can't comment on long term use, but in the short term it is easy to use and not upsetting my sensitive skin. Only been using this for a couple of weeks. I like it. It is nice and creamy and rubs in well. Not sure if this is improving my magnesium status yet, but it's more pleasant to use than the oil - my skin isn't so sticky with this. I bought both the body butter and the body lotion. I find the butter is extremely hard to rub in and really like the lotion much better. 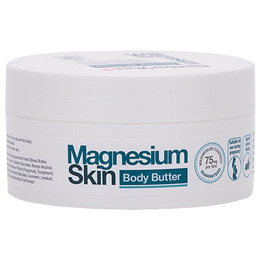 BetterYou MagnesiumSkin Body Butter is a luxurious body butter which contains 15% BetterYou magnesium oil, shea butter, cocoa butter, coconut oil and vitamin E.